YACE64 (Yet Another Commodore 64 Emulator) is an emulator for Microsoft Windows, which emulates a C64 and one or two 1541 floppy drives. The main aspect of the emulator is the graphics and sound experience. 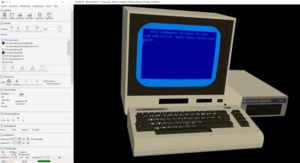 It is possible to transform a C64 program into a real 3D view. There's also a server version, which can be controlled with an iOS client for iPhone and iPad. YACE64 with the game Poolbilliard with active 3D Transformation.. The program can directly be downloaded and installed from the website. After the start it is necessary to configure the path to the ROM files in the configuration dialog. The ROM files can also be configured automatically. These files can be found here zimmers.net. Finally the program restarted and is ready for use. The emulator is completely written in C++ 11 without usage of 3rd party libraries. The Windows program uses .NET 4.5 with WPF, Direct3D11, DirectSound and DirectInput.